We experienced a little remnant of cooler weather last night so I prepared a slightly more warming dish along with a lighter one. It was cool enough to turn the oven on for a Roasted Cauliflower dish I’ve been wanting to make. I saw one version of it in the newspaper last month and I took the idea and created my own version and served it with a lighter dish—steamed kale and shiitake mushrooms with tofu. One large head of organic cauliflower (about 2 pounds) washed and cut into florets. spices of your choice. Tonight I used paprika, coriander, cumin and garlic. Preheat your oven to 450 degrees. Spread the cauliflower and onions onto a roasting pan. In a bowl, mix the olive oil, vinegar, sea salt and spices to suite your tastes. Drizzle the seasoning mixture over the cauliflower and stir to get each piece coated. Sprinkle with pepper. Roast the cauliflower until it’s tender, about 35 minutes. Stir occasionally while it’s cooking. 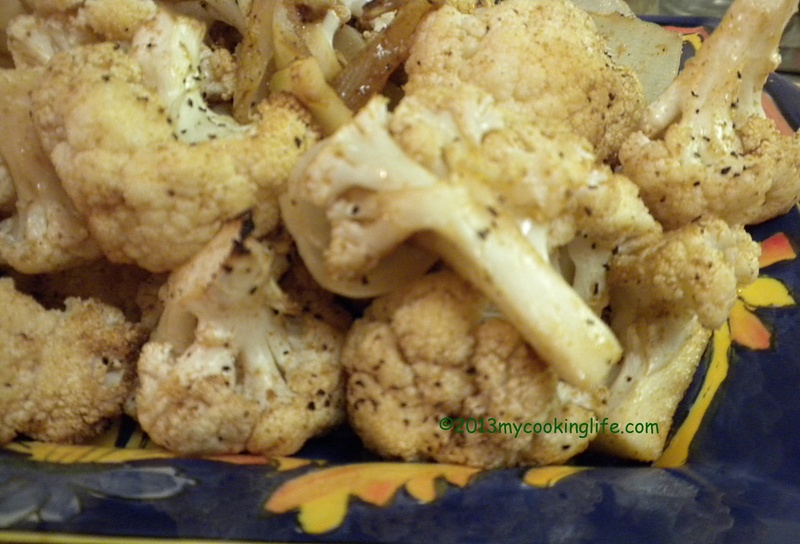 This entry was posted in Cooking, Recipes, Vegetables and tagged cauliflower, how to cut into florets, Olive oil, roasted vegetables, spices by mycookinglifebypatty. Bookmark the permalink. I like roasting cauliflower so much better than any other cooking method. I then like to toss it with pasta. Makes a great vegetarian meal. I have never added wine vinegar – have to try that. I hadn’t used vinegar for roasting veggies before either but I really liked it. Thanks Jovina for your comment!